For a video talk explanation of London’s shocking Air Quality problems click here for Clean Air in London‘s One Atmosphere presentation (34mins). For daily text pollution alerts from AirText click here. Air in North London is monitored with Automatic monitors, managed by the Environmental Research Group of King’s College London and Non-Automatic monitors, often installed by concerned citizens These reveal how badly EU pollution limits are being exceeded at particular spots. But to get an idea of pollution during typical trips for individuals, an experiment was carried out by a BBC journalist in March 2016 ‘How much diesel pollution am I breathing in?’ using a personal exposure meter loaned by Kings College London. St Pancras station concourse – 13.2. Diesel air conditioned train – 8.5. The experiment may not have been scientifically thorough, but it gave a good indication of the relative pollution levels that affect you, and your loved ones – in different places, on different days and in different ways to get about. Readings at fixed points can only give glimpses into the problem and ideally monitoring would be per person per route. Camden has summarised the causes of PM10 and NO2 pollution, at a London level and at a Camden level, from raw data from Clean Air for London in its draft Camden Clean Air Action Plan 2016-18 (for public consultation February 2016). The data shows that harmful emissions arise indoors as well as outdoors. Based on these London wide figures, priority should be given to reducing the pollution from cars, HGVs and LGVs. However, Boroughs that have high levels from construction or aviation, for instance, also need to tackle these. Camden has 5 automatic monitoring sites at: Bloomsbury, Euston Rd, Holborn in Mid Town, Shaftesbury Ave and Swiss Cottage. There is a strong emphasis in this Plan on working with and challenging others to do more about air quality. This includes, for example, lobbying regional and central government on policies and issues that are not within Camden’s power, as well as working with the GLA, other Local Authorities, schools businesses and community groups to deliver project that promote cleaner and healthier travel and buildings. working with the network provider to improve the coverage and reliability of Camden’s existing electric vehicle charging network. Explore options to fund rapid charging electric vehicle infrastructure. Increase the additional charges currently appended to business and resident parking permits if the vehicle being registered is a diesel. encouraging schools to join the TfL STARS accredited travel planning programme by providing information on the benefits to schools and supporting its implementation. 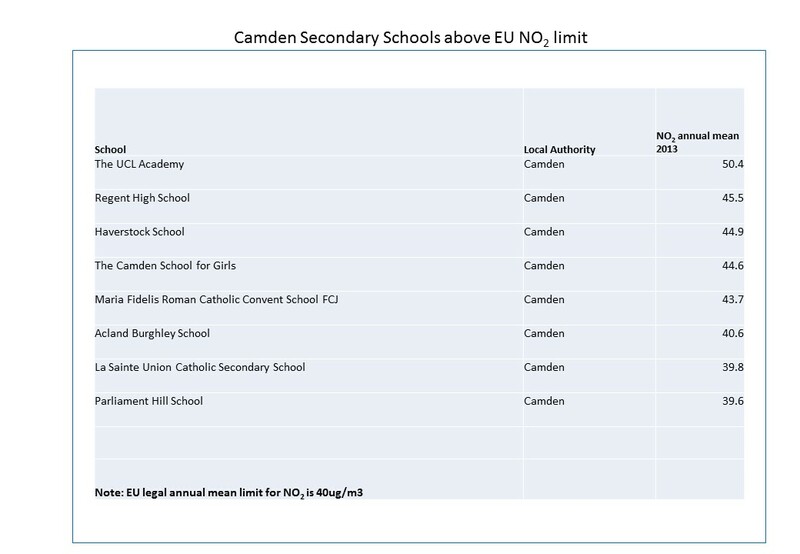 Camden already has distributed a Schools and Nurseries Cleaner Air Fund. Using MAQF2 funding from the GLA and in partnership with King’s College London, work with developers on improvements to dust caused by constructions. Domestic, Business and Inhouse measures to promote fuel saving measures for domestic, commercial and their own premises. Provide support and guidance where appropriate to ‘citizen science’ projects planned by businesses or resident groups. 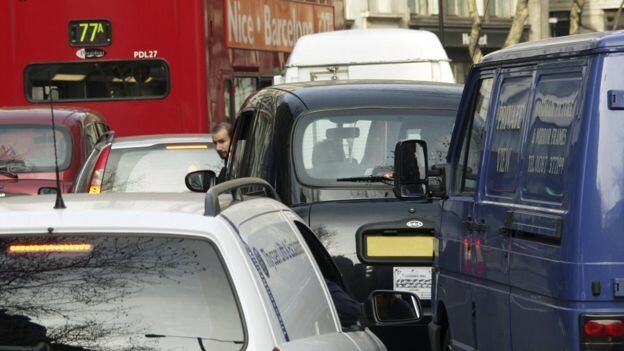 Camden also intends to continue monitoring and to lobby and liaise where it could influence other bodies, such as TfL, the London Mayor and Government to use their powers to reduce pollutants. Part of Camden’s communication initiative is its Green Camden web site with advice such as lowest pollutions modes of transport, school air quality, electric transport etc. One initiative is the Camden Climate Change Alliance helping local businesses adopt low carbon (low pollution) measures. were above the EU limit for NO2 of 40ug/m3. As reported in the Guardian 1st July 2016. And 3 more were to be added: Wood Green High Rd, St Aidan’s School and Jackson’s Lane. Since then Haringey Air Quality Assessment and Screening 2014 has been published. Haringey currently has just two automatic monitor sites at Priory Park South and Haringey Town Hall. investigate the possibility to exclude or reduce electric vehicles from controlled parking zone payments and other car parking charge schemes that are in operation across the borough and under council control in order to incentivise the take-up of electric vehicles. Support walking and cycling and actively encourage children, parents and staff to walk or cycle to school. increase charging point spaces for new developments through planning conditions and Section 106 agreements. P21 The Tree Strategy outlines the council’s commitment to increasing the total number of trees under its ownership, although not specifically related to traffic pollution absorption. require major developments to have an air quality assessment as part of the planning application. Haringey is continuing to work with the GLA and Defra to explore further the possibility of legislating against the installation of biomass boilers in AQMA areas and employ other types of renewable energy technology. strive to achieve a 40% reduction in carbon emissions from the council’s own estate and operations by 2015.
continue promotion of and raising awareness of carbon reduction measures to all who live and work in Haringey. Because the problem is complex, and the causes are often not near the effects – or are even visible – citizens can be more effective by working together and pooling resources. They can support positive action from the authorities; work on additional data gathering; investigate possible solutions and lobby people who could do more. See also the Green Alliance’s A Greener London -What the Next Mayor can do to Improve our Capital and Clean Air London’s Clean Air Manifesto for the Mayor. The Media is also putting pressure on the authorities to take action, such as Today , The Evening Standard “Revealed the 20 Blackspots for Toxic Air in Londons and The Guardian “The Truth about London’s Air Pollution“. See above for Camden and Haringey Council’s activities. See Air Pollution – Local Effects from Global Causes for GLA, TfL, UK Government and EU aspects. See below for some local North London initiatives to monitor/understand and publicise the worst pollution culprits and locations. See also Mapping for Change that advises on citizen monitoring and advises on purchasing of monitoring equipment. Or I Like Clean Air that offers monitoring services. Nature in July 2016 said that it is important to Validate personal air-pollution sensors or regulators could be flooded with misleading data. Just for example the following ideas include one that would identify vehicle by vehicle their level of pollution opening up options to remove the worst offenders; a possible way to absorb pollution through trees and a smart way to tailor (better) data to help people avoid polluted routes. A trial by the Universities of Birmingham, Leeds and King’s College London, in Feb 2016, funded by the Department for Transport is for pollution cameras trialled in Birmingham and London “The US-manufactured devices shine a laser beam through exhaust fumes and use reflected light to measure levels of toxins. In America, the cameras are used to identify and reward the cleanest car drivers from their annual emissions test.” The Driver and Vehicle Standards Agency (DVSA) must introduce legislation from May 2017 with changes to emission inspection tests from May 2018 to comply with EU Directive 2014/45/EU. This could be the point at which MOTs could use updated testing technology. Air Quality News reported in 2012 on the woodland conservation charity’s ‘Urban air quality’ report in collaboration with Lancaster and Birmingham universities which examines how urban greening can be best tailored to achieve air quality goals while creating health and social benefits. Haringey promote the use of Walkit. Although this tool may not be based on sufficient data and the low pollution choice is only available for inner, west and north London there could be potential to create a smarter App. Perhaps there is scope to utilise Kings College London personal exposure meters as discussed above. For instance the Mayors office calls for Londoners to send in any ideas of steps that can be taken to spot problems with construction sites. One idea is for contractors to use Hybrid machines, rather than continuous diesel machines, such as Firefly. For instance Underground Ventilation could affect PM2.5 pollution according to the EU. Another powerful approach is to use the Courts. For instance Client Earth’s case against Defra for missing EU pollution targets requires expertise and funds. They are asking for crowd funding for the next step of its NO2dirtyair action against Defra. “As the government can’t be trusted to deal with toxic air pollution, we are asking the court to supervise it and make sure it is taking action.” You can also seek recompense for loss and ill health through the courts. For instance “If you, or a member of your family, have been affected by air pollution and your health has suffered” contact Hodge, Jones and Allen of Hampstead, as they are “examining the possibility of bringing a “right to life” challenge arising from the health impacts of air pollution.” In June 2016 the first case was announced – against Lewisham and London. EU. Your London MEPs are listed here. Make sure that your MEP knows your concerns about the ineffectiveness of the vehicle emission regulations and the relaxation of the levels when the Real World Driving Emissions test are introduced. Seb Dance is the London MEP, listed at the link, who is a member of the Committee on Environment, Public Health and Food Safety. UK Member of Parliament. You can write to your MP here. Possible topics include Diesel scrappage, Vehicle Licence Taxes (Department of Transport). Another thrust would be around pollution near schools. 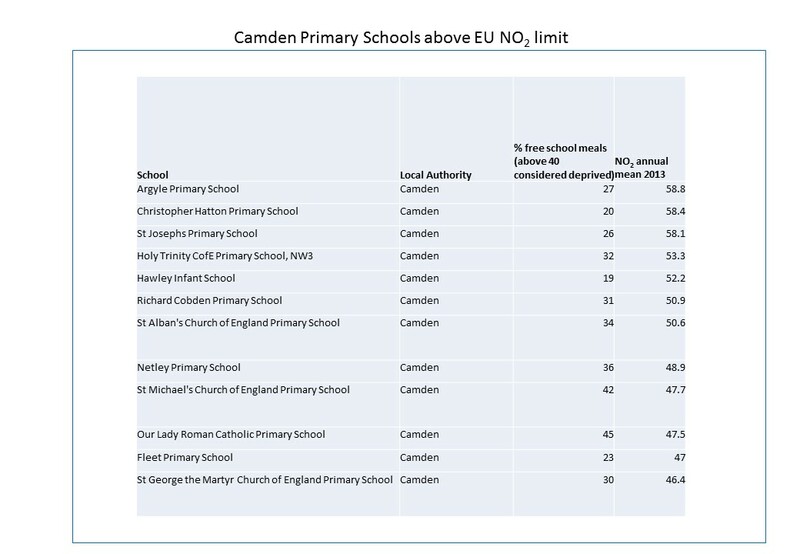 The Camden Schools and Nurseries Cleaner Air Fund in 2013 came up with many ideas to improve air pollution and the Government could require new Academy owners to follow best practice. These are just a very few suggestions, but a concerted effort by Citizens to express their views could make a significant difference to action. To contact your Camden Councillor click here. The Highgate Neighbourhood Forum Campaign for Cleaner Air aimed “to post diffusion tubes at 50 locations for a month and measure levels of NO₂ (nitrogen dioxide).” They will participate in the Hampstead Forum’s initiative above. The meeting was hosted by Castle Debates and was be chaired by environmental lawyer Pamela Castle OBE. To contact your Haringey councillor click here. Haringey Council’s Transport Forum has published Haringey Transport Forum 31-1-17 – Air Quality report. This shows that the majority of NOx from transport in Haringey is from TfL buses, followed closely by diesel vehicles. (p11). It also shows that Wood Green is one of the most polluted corridors in Haringey (p8). Neighbourhoods of the Future. The Mayor announced London NoF winners in Jan 2017. Haringey will update it’s Air Quality Action Plan during 2017 and undertake projects as part of the Haringey Transport Forum Neighbourhoods of Future including electric charging for Taxis, encouraging businesses to trial and adopt electric vehicles and publicity events promoting clean transport. What can the new Mayor do? Speakers: Ian Mudway – Kings College London Andrea Lee – Client Earth Areeba Hamid – Greenpeace Murad Qureshi – London Assembly (Transport) Seb Dance – London MEP . It was also attended by Peray Ahmet, Haringey’s cabinet member for Environment and Catherine West MP. The ideas will feed in to Sadiq Khan’s consultation on the Ultra Low Emission Zone.